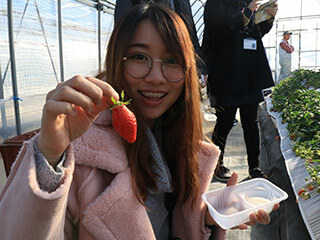 Shimizu Farm Strawberry Picking (シミズファームイチゴ狩り) is one of the fun winter activities in Kofu, Yamanashi Prefecture. Strawberry is a fruit of winter and Kofu has a great Strawberry farms that you can enjoy all you can eat picking. Strawberry picking is available from January to early May and January and February are the best season. You can enjoy with a baby stroller. 1. use a local bus to KofuShokasenmongakko. The strawberry of Shimizu Farm has little sourness, rich fravor and sweetness. You can enjoy strawberry pikcing from January to the middle of May. The best season for strawberry picking is January and February. You can eat as many as you want in 30 min. You use milk sources for dipping. You can refill.